I am always on the lookout for a new way of doing things when it comes to personal computing, and one of the best ways to do so is to experiment with different window managers for Linux. Since I have my laptop set up as an Ubuntu test platform, and since APT makes it easy to download and install applications and not find myself in dependency hell, my laptop seemed to be a great way to play around with a window manager about which I’ve been reading for some time: Openbox. Those of you who are familiar with LXDE will have some experience, albeit limited, with Openbox, as LXDE is based on it (with a bunch of other cohesive applications and a consistent look and feel integrated to complete the transition from “window manager” to “desktop environment”), but Openbox will seem much more familiar to users of Blackbox and Fluxbox, predominately in the sense that Openbox is built very light and minimal, with a desktop bare of icons, and a user-defined right-click menu that is used for launching applications. Like Blackbox and Fluxbox, Openbox is also dockapp friendly, and as a window manager it runs very fast on limited hardware. I’m a big fan of Fluxbox, so I thought it worthwhile to give Openbox a try, if nothing else to give me material for a Linux Critic writeup, and instead I found that I just liked using Openbox, so this turned out to be more than just a review. If you’re running something like Slackware, Openbox source code can be downloaded from the Openbox website, and Slackbuilds has a workable alternative. Trust me, you’ll thank me for that second one. Once you have everything installed, in Slackware you will be wanting to run xwmconfig to pick your default window manager (if you’re a runlevel 3 kind of user). In Ubuntu, or if you’re booting up with a graphical login manager in Slackware, simply select Openbox from the session menu before logging in. Okay… it’s empty. Now what? Configuration! Yeah, that’s what I thought too. Openbox out-of-the-box is VERY spartan. Your default first look at this window manager will likely make you think “uh… when will it finish starting up?”. The answer to that is simply “it’s already done!”. Openbox by default is a bare, grey desktop and nothing else. No toolbar, no icons, nothing. So we’ll tackle configuration one element at a time. First, let’s talk about where we find all this stuff. 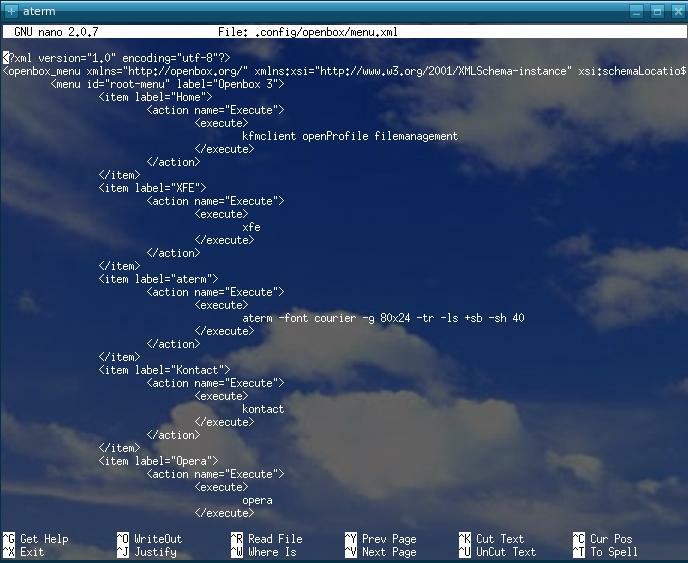 Everything Openbox does as far as behavior is defined in this single XML file. This will force Openbox to use your personal config for it, in your home directory. If you ever break something in it, you can always copy the system one again (in /etc/xdg/openbox/ ) and start fresh. The first thing I did in Openbox was explore the Openbox menu. Remember when I had you install something called “obmenu” before? Here’s where it comes into play. 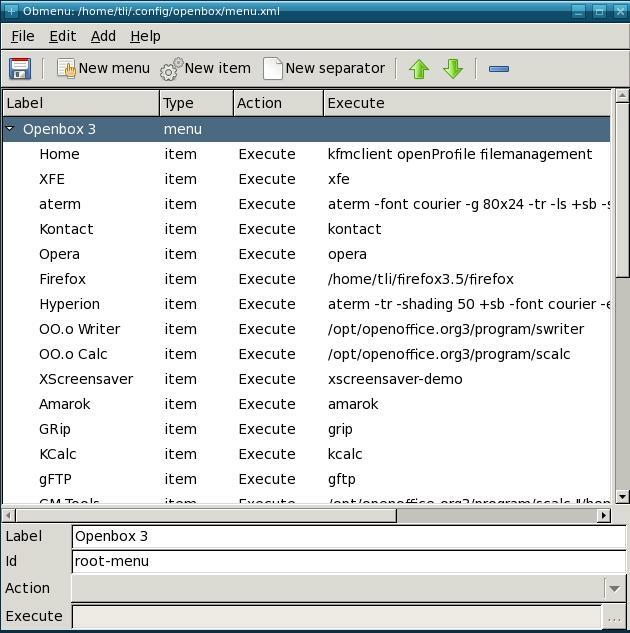 If you haven’t noticed already, Openbox’s configuration file and its menu file are both XML files. XML has its advantages and disadvantages, and one of those disadvantages is that it does make editing Openbox’s menu a bit more complicated if it’s done by hand. Blackbox and Fluxbox users out there will see this as one of the bigger differences between Openbox and either of those other window managers… Blackbox and Fluxbox flat text files are a lot easier on the eyes when working with them than Openbox’s XML files tend to be, at least at first. But Obmenu provides a nice, user friendly graphical front end to Openbox’s menu. I actually had my Openbox menu pretty much the way I like it before I found myself wondering “is there a graphical editor out there for this?”, and found that yes, there was! And I wished I’d thought that before I spent a good twenty minutes editing the XML by hand. Don’t get me wrong; this isn’t too hard to do, just tedious. If you install Openbox from APT repositories, you’ll find that it’s packaged with a pre-generated “Debian” submenu; this is normal. It’s actually kind of handy (I left it in mine) because it does provide some apps that you might not think of adding to your custom menu at first. Again, those of you who use Blackbox and Fluxbox already have a good idea of what you’ll want on your Openbox menu. I basically used my Fluxbox menu as a template and made my Openbox menu more or less identical to it. try out wmii as a window manager, its also fun. Thanks, I’m unfamiliar with wmii. I’ll have to go see what it’s about! Try tint2 as a panel with openbox. It doesn’t have a tray so if you want one, you might need docky which sits in your dock area.